Sitting area for evening cocktails in the den! Upstairs kids bedroom - Surf's Up! Outside shot of the home. Garage available for guest use. Welcome to Over The Moon located in the heart of Chatham's Gold Coast at the base of the Oyster Pond River, opposite Harding's Beach. When it comes to location, your search ends here. 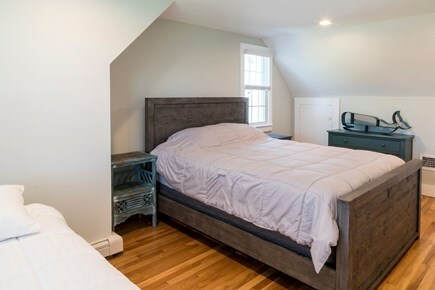 From this convenient address you can take your kayak out for a trip up the Oyster Pond River, you can paddle board out to Stage Harbor, and you can bike into quaint Chatham center. 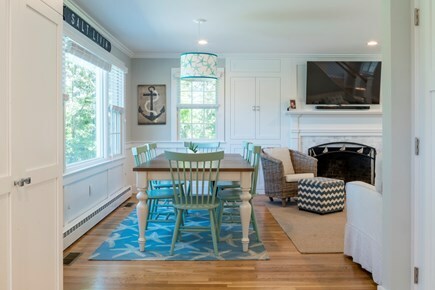 The home has deeded beach rights to the Oyster Pond River. Walkers will find the thirty-minute stroll to town scenic and easy; the majority of the trip has sidewalks. The estate is located on quiet dead end street tucked off of Stage Neck Road. 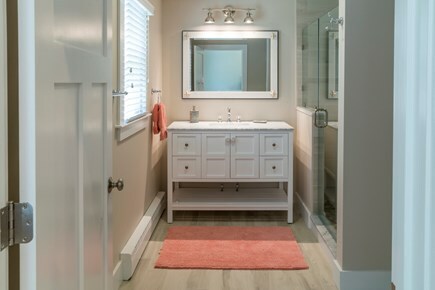 The home was remodeled in 2018 with a new, open floor plan. 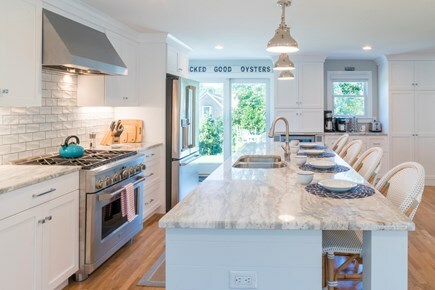 The kitchen features a chef's six-burner gas stove, a nine-foot island and every accessory one could ask for. 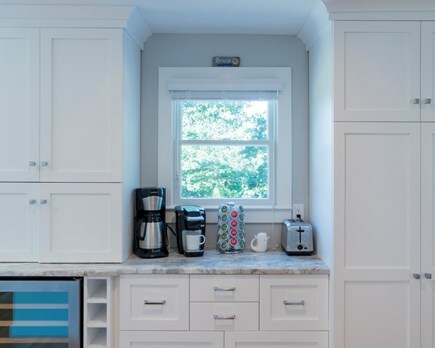 Wrapping around the opposite side of the kitchen is the dining area with seating for six to eight people. This large room opens to a living space with sitting area featuring a wood burning fireplace and television. Directly off the opposite side of the kitchen is additional den/sitting/bed room with more areas to lounge. There are two master bedrooms on the first floor. 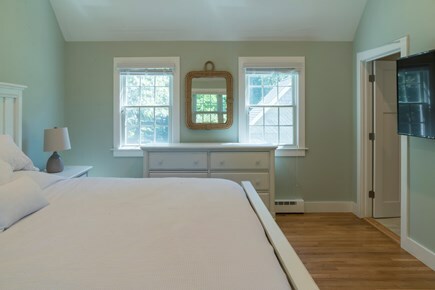 The first bedroom is located off the main living room and features a king-sized bed, half vaulted ceilings, and private master suite bath. There is also a private sitting area in the back yard located just off the hallway to the master suite. Opposite the mater suite and above the garage is a 500+ SF In-Law Suite with a king bed, kitchenette, full bath and sitting area. This is the perfect place for your parents, in-laws, guests, or au-pair. The second floor of the home has two bedrooms with a full bath. The first bedroom has a queen and twin bed. The second bedroom has two twin beds. The house can sleep nine comfortably plus two more on a queen sleeper bed located in the den off the kitchen. On the grounds of the home you will find a large and expansive yard. The rear patio has seating for six, a hammock, a grill and Adirondack chairs. 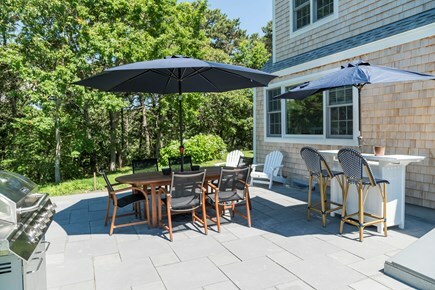 Of course, no cape house is complete without an outdoor shower! We do have some toys, beach items and other necessities of summer, so please inquire about anything specific. Additional pricing info: Cleaning Fee of $250, State and local taxes of 12.45% will apply. Yes. Two first floor bedrooms including In-Law Suite. We stayed at 'Over the Moon' the first weekend in April for a girls' weekend. In total, there were 8 of us and the house fit all of our needs. The house is beautiful and you can tell it has been recently renovated, it looks exactly like the pictures. We spent the majority of the time in the spacious kitchen and loving the huge island in the middle to hang about. We cooked the first night and found everything we could need including a blender for margaritas. The wine fridge is a very nice touch. The beds were very comfortable. The only downside was that we had to bring our own towels and seemed to leave hand towels for the bathrooms off the list, minor detail. Saturday afternoon was sunny so we sat outside on the patio. The yard is huge, but beware of the wild turkeys wandering about. They can be very loud in the morning. The owner, Tim, was very responsive in answering my emails. Also, the property manager checked in on us the afternoon we arrived, which was very nice. All in all, it was a wonderful weekend. None of us wanted to leave. 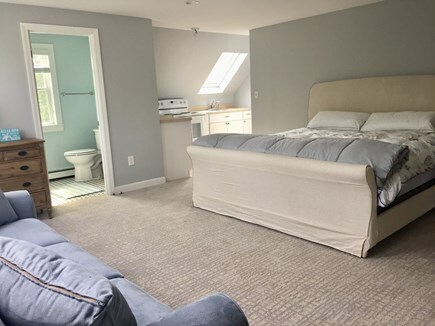 If I ever find myself in Cape Cod again, I will definitely try to book 'Over the Moon'. This beautiful home does not feel one bit like a rental...this luxurious, spacious and clean home will make you never want to leave. The owners did not miss one beat on amenities or style. This home is perfect for anyone wanting to stay in Chatham...you are close to all Chatham has to offer along with a beautiful yard and patios to enjoy when home. We have found our Chatham rental for years to come! My wife and I have spent the last 9 years visiting Chatham since we were married there and this is by far the best place we’ve stayed. Yes, the location is great but what really stands out is the quality of life this home provides. Whether you seek the solitude to relax/hide from the kids or one to entertain, it has the perfect layout to do so. The outdoor space has a huge lawn for kids and adult schenanigans with amazing privacy on a quiet street. This house is beautiful and has everything needed for a great vacation. Everything is new and high end. Plenty of room to host multiple families. The home is located in a quiet neighborhood and is great for kids using bikes and also nice for long walks or runs. The yard is huge for all activities. Would recommend this house for your next vacation in Chatham. 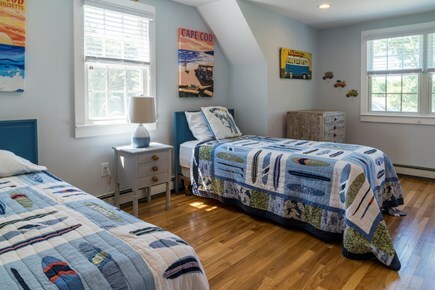 Growing up in a bed & breakfast in Southeastern Connecticut, having a vacation rental home was second-fiddle for my family. My wife & I bought our first property in Chatham in 2010 as a bank owned foreclosure that needed just about everything top-to-bottom. What started as a project quickly became a passion. 3 properties later we seem to be getting better every time. 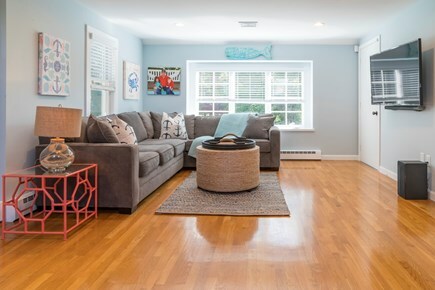 Summer Catch is our latest & greatest house in Chatham where you feel like you have just come home instead of just walked in to another vacation rental. The finest detail is found throughout the property and as one of our first guests ever put it: ''they thought of everything''. One of our biggest compliments. We hope you enjoy our home-away-from-home as much as we do. 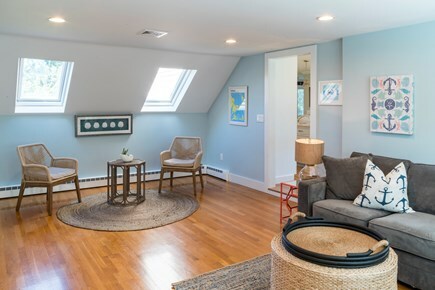 After renting homes all around New England for almost 20 years, we became frustrated with old, out dated houses that were uncomfortable to stay in and never had anything you were looking for. If you have ever stayed at a vacation home and noticed that the silverware was a combination of 8 different sets and the china didn't match you know what we are talking about. If you are looking for the home-away-from-home with everything you need, this is your spot. Our goal is to provide Clean, Comfortable & Convenient vacation experience for our clients. 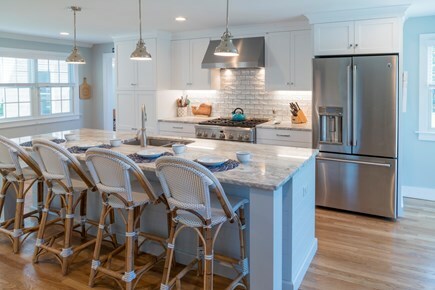 We took everything we didn't like about renting on Cape Cod and Nantucket for many years and made sure our houses (two in Chatham, the other listing is at VRBO Listing #345002) we are the premier luxury, turn-key vacation rental experience. If we don't have it, you don't need it! Based on our client feedback, you will enjoy your time in Chatham staying with us. Chatham is quintessential Cape Cod. 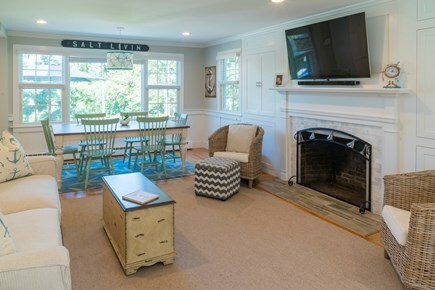 From the famed Chatham Bars Inn (just a 10 minute walk away) to the old-school Cape Cod Baseball League (10 minutes as well) to the shops & restaurants of downtown, you will have a truly unique vacation experience. Get in your car and drive North (well, really ''South'' because you are upside down) to the National Seashore where you find the REAL dunes on the cape! 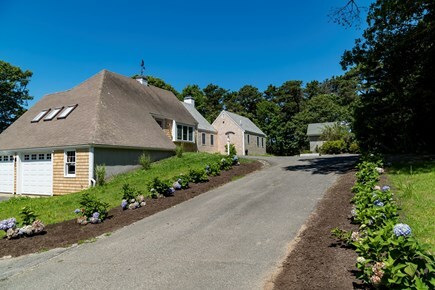 Wind your way down through Eastham, Wellfleet, Truro and all the way to the tip of Cape Cod in Provincetown. Along the way, you can swing by the Beachcomber, buy a bottle of wine at Truro Vineyards and have a lobster dinner in P-Town. Don't worry, ice cream for desert awaits you as well!